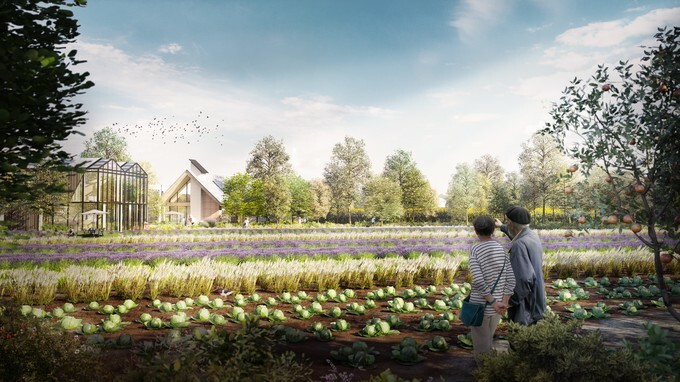 "A half-hour commute from Amsterdam, a piece of farmland is slated to become a new kind of neighborhood. 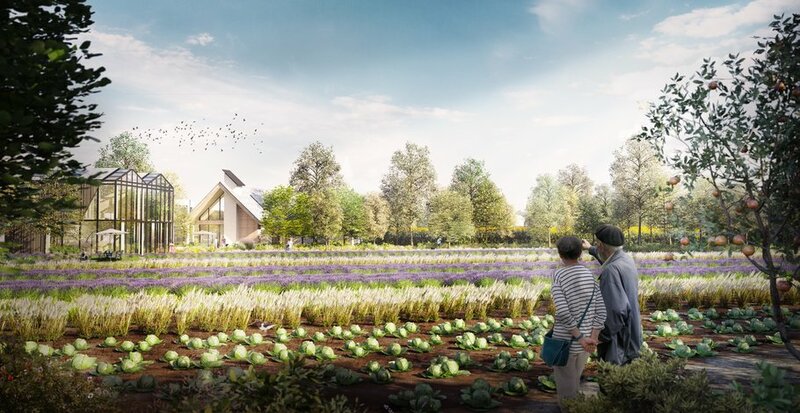 Vertical farms, along with traditional fields and orchards surrounding homes, will supply food to people living there. Food waste will turn into fish feed for on-site aquaculture. Houses will filter rainwater, but won’t have driveways. 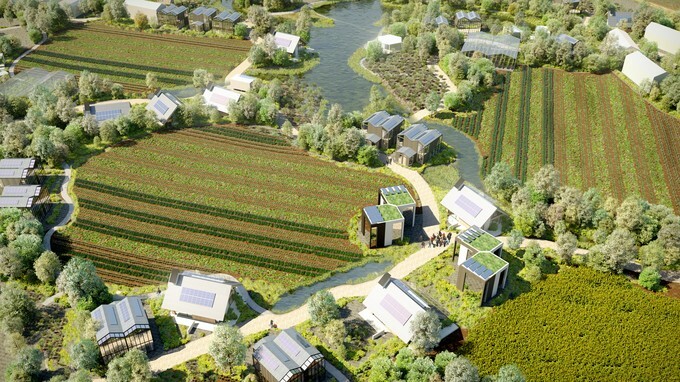 A “village OS” tech platform will use AI to simultaneously manage systems for renewable energy, food production, water supply, and waste." 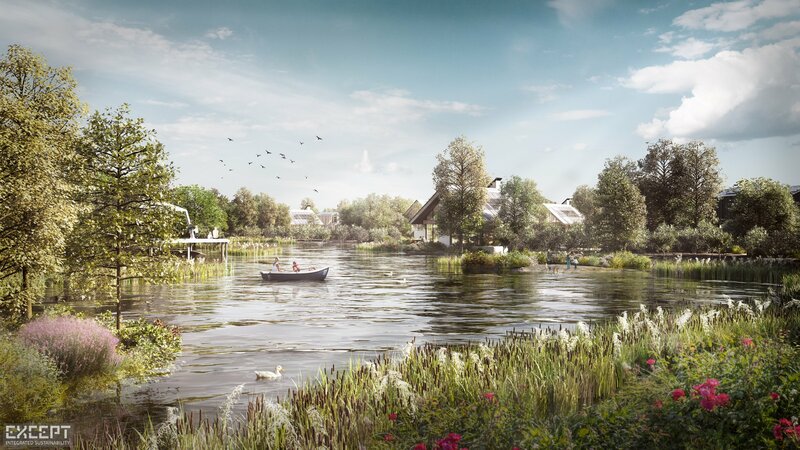 The village focuses not just on energy and materials, but also on the quality of life of its inhabitants. Community centers allow working, socializing, learning, and providing social support and celebration. The neighborhood is largely car-free, prepared for a new era in mobility for self-driving cars and innovation such as drone deliveries. A fully integrated closed-loop (circular) urban metabolism. 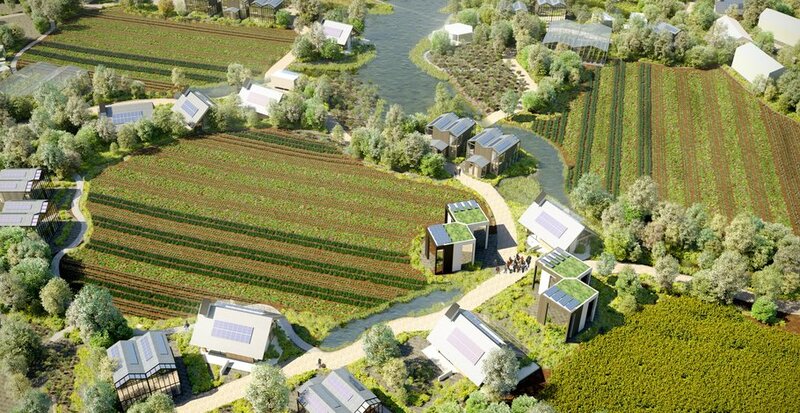 It is self sustaining in energy, potable water, food production, and waste water management. 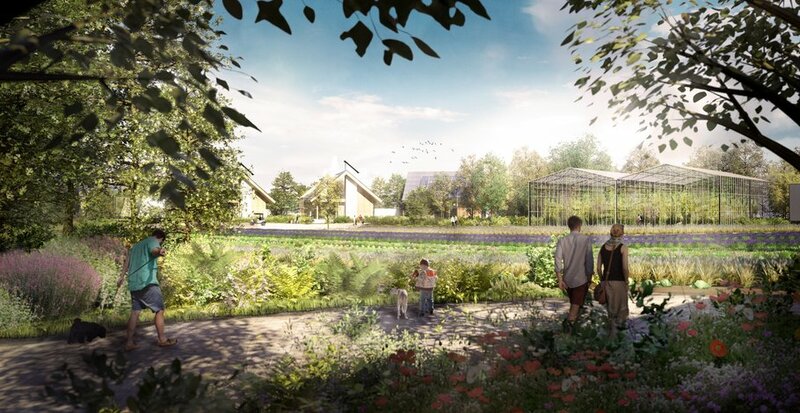 A lush landscape, integrated with food production based on permaculture, and agroforestry. Greenhouses provide efficient hydroponic growing systems and vertical farming for fresh vegetables, fruits, and herbs. Resilience against changing weather patterns, flooding, and sudden flood storms with integrated storm water management. 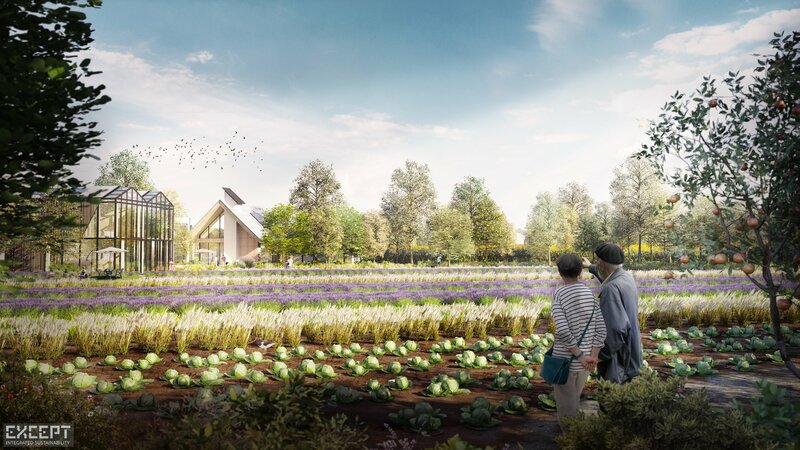 A landscape optimized for regenerating biodiversity, optimizing species diversity, ecosystem services, and health benefits to inhabitants. 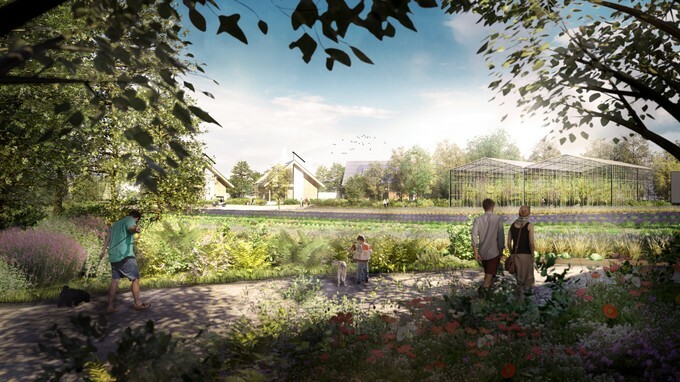 A healthy city approach, with plants and trees filtering the air, natural renewable materials, toxin prevention, and zero fossil fuel use on site. Affordable housing, that is financially feasible to build, with modular housing components reducing production cost and increasing housing quality. Located near the city of Almere, the 25 hectare site for ReGen Villages sits in the area of Oosterwold, which has an experimental planning zone. 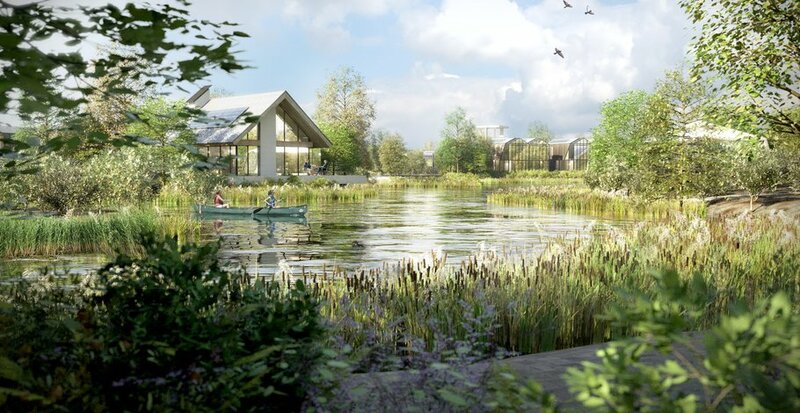 While the areas is intended to support sustainable living, a truly integrated plan was challenged by rules that prevent connectivity and collaboration between housing blocks. This proved specifically difficult to implement our plans for an advanced integrated sustainable neighborhood. Despite these challenges, we worked dilligently with the municipality to ensure all rules were followed to the letter. 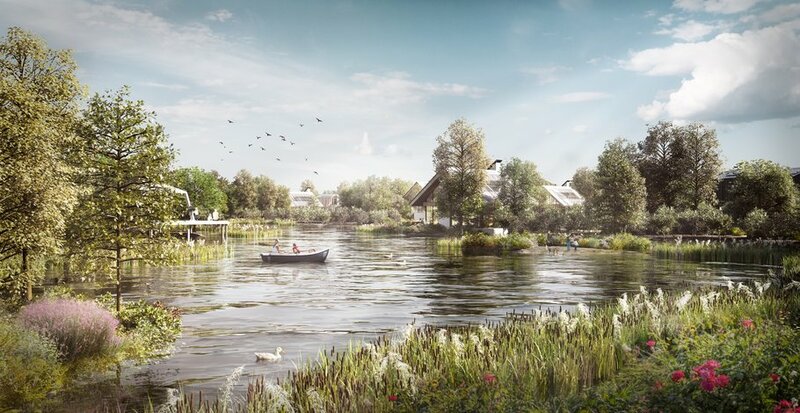 The masterplan received planning permission in July 2018, allowing the project to continue. 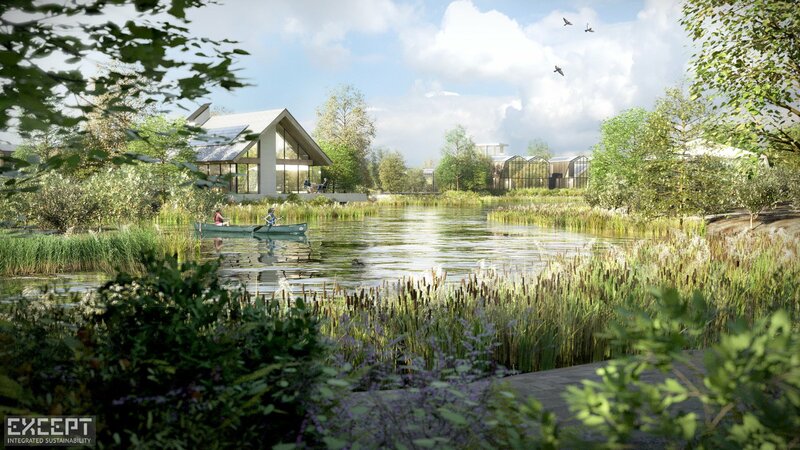 For more information on the project, see this article in Fast Company, or visit the website of ReGen Villages.